-Use the lit stick in your inventory to light the two torches. 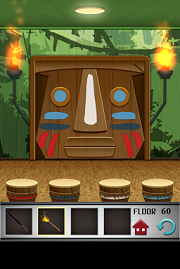 -Notice that the colors on the door correspond to those marked on the drums. You need to start from the leftmost drum to the rightmost one, and hit each one the number of times that specific color appears on the door. e.g. You need to hit the red drum 4 times because there are 4 red marks on the door. -So, from leftmost drum to rightmost drum: 4 times, 2 times, 1 time, 4 times.